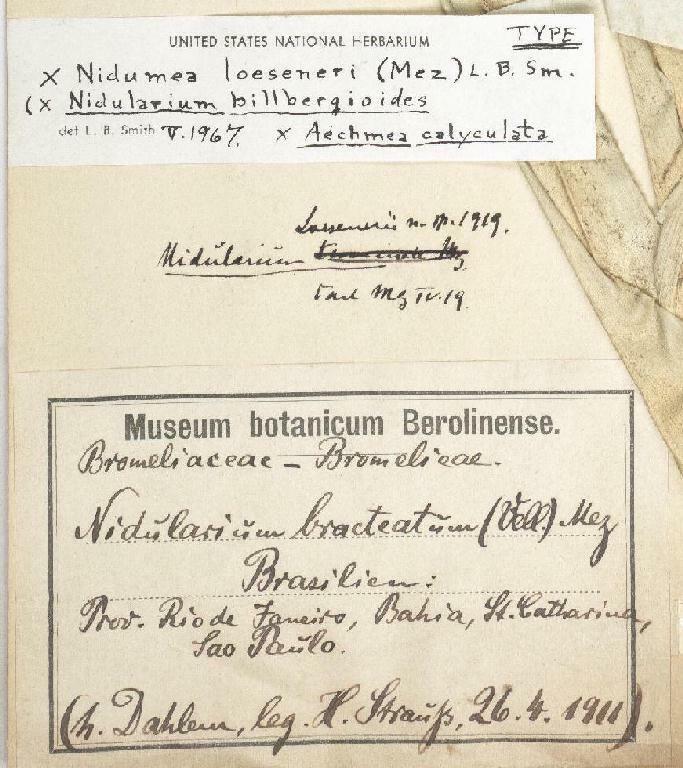 From fcbs - "First described as xNidumea pre-1911, See fcbs 'Natural hybrid List/Data base' for detail because plant not living at time of naming. Originated as Aechmea loesenera and then treated by Mez as Nidularium loeseneri. Smith decided in 1968 that it was a natural bigeneric which it appears to be but choose two species as parents even though there seems no proof that they were! The seed parent suggests this bigeneric should now be xAechopsis. 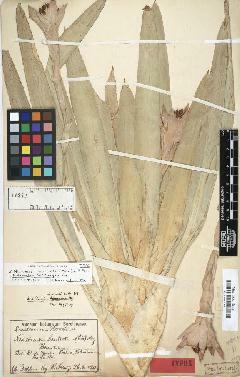 The plant was not in cultivation at the time it was named by Smith and is not under the ICNCP rules but has been dealt with on fcbs as 'Natural' hybrid xNidumea. See xAechopsis Lioness for next episode in this saga. 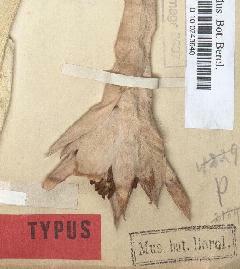 Reduced image of Herbarium type specimen. Röpert, D. (Ed.) 2000- (continuously updated): Digital specimen images at the Herbarium Berolinense. - Published on the Internet http://ww2.bgbm.org/herbarium/ (Barcode: B 10 0243640 / ImageId: 252642). 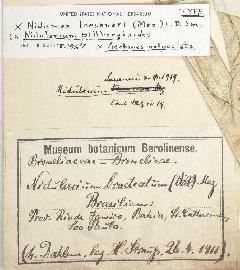 © Botanic Garden and Botanical Museum Berlin-Dahlem, Freie Universität Berlin.